Thank you to everyone who donated to Sergei!! We raised $844.40 for him! That's pretty great! His account is now at $12,106. That will surely help a family that chooses to adopt him. Thank you, again for your generosity!!! Here are the winners of my giveaway. 1st place gets first pick of the prizes, 2nd gets second pick, etc. I'll contact those whom I can. Please contact me and let me know your email address ( I'll notate below if I don't have your email. ). Sweetsergei@hotmail.com Thanks, again! Hello again!! As you can see, I haven't kept up with my poor little blog for an entire year!! I thought that my annual fundraising Giveaway for Sergei is a good reason to dust off my blog and get it going again!! Some of you may remember my attempts the past 2 Christmases to raise money for a little orphan with Down syndrome during Reece's Rainbow's Christmas Angel Tree fundraiser. He is called Sergei G. on the Reece's Rainbow Waiting Children page. You may also remember that you and I have helped raise over $11,000 for his adoption fund since 2010!!!! It is pretty sad that he is still waiting in an institution as another Christmas passes by and as his 7th birthday passed by in November. However, we can work extra hard this season to get his adoption grant even larger. Reece's Rainbow is an organization that promotes the international adoption of children with Down syndrome (and other special needs) in a way that seems very unique to me. They create accounts for each of the children on their 'Waiting Children' pages and people can donate to a specific child. When a family comes forth to adopt a child, the money in that child's account is used for the adoption fees. If the adoption falls through for some reason, the money stays in the child's account so that another family can make use of the money! Here is some info that will SHOCK you! 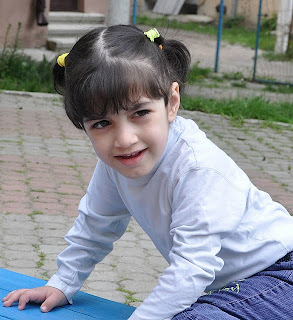 In Eastern European countries, right now, babies that are born with Ds are immediately put into orphanages. Their parents are told that their babies aren't capable of learning, loving or living a life and that they should be cordoned off from the rest of society. There are not options for Early Intervention therapy, doctor intervention or even schooling. 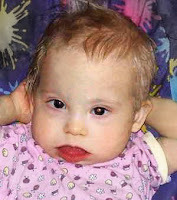 Oftentimes the families of people with Down syndrome are shunned and find it difficult to find work and other necessities of life. Therefore these sweet sweet babies are abandoned to orphanages FILLED with all the other children that don't look 'perfect', that have some extra special chromosomes, or had a difficult start to life because their mama drank and drank throughout the pregnancy. When these babies become grown and old, no wait, when they turn 3-6 YEARS old (!!!) they are transferred to adult mental institutions. Insane asylums. Locked up. Left in their cribs. Thrown a bottle of food and possibly given a diaper change. Most of these medically fragile darlings die within the first year due to neglect and horrible living conditions. While Chad and I hope to adopt one of these angels in the future, it is not our time yet. So the least I can do is shout out for Sergei and try to find him a family AND get some more money into his adoption fund!!!!! It costs $25,000-$35,000 to adopt a child with Ds from an international orphanage/institution so I set a CRAZY goal for myself, and for you all, to see if we can add $5,000 to his current adoption fund of $11,261.60. That would put his grant at $16,261.60!!!!!!!!!! I am so excited to think you, my friends, can work together to give one boy a chance!!!! A chance of finding a family to love him! A chance to give a potential family a good financial head start toward the huge cost of international adoption. Oh, please help Sergei find a family!!! Please tell your friends and family. Please go to Reece's Rainbow's Angel Tree kids and gaze at all of these beauties with Down syndrome; gaze at their sweetness; their innocence. Do any of them touch your heart? Does Sergei touch your heart enough for you to repost on Facebook or to email my blog to your family? To donate? Now here are the GIVEAWAY details for all those people out there who like the idea of 'winning' a sweet Christmas present to either keep or give away, there's an added incentive in giving to sweet Sergei. 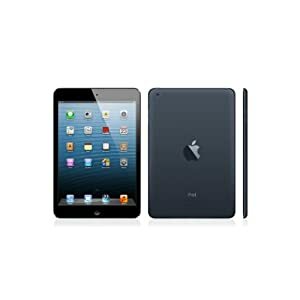 1st Prize is a brand new 16GB IPAD MINI!!!! Additional prizes include some very cool hand-knit items from the very talented Kait Brink. 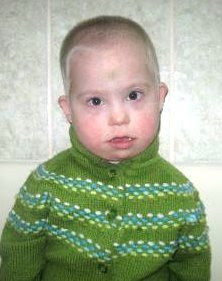 Kait is a very talented artist and knitter and has donated a bunch of items to help Sergei! Thanks Kait!!! Charcoal & Seafoam hand tote. Stay tuned for additional items to be added! Every donation of $5 will give you 1 entry into my giveaway. A donation of $40 will qualify you for 10 entries! Bonus Entries: Anyone who donates has the added option to gain more entries by posting about this giveaway on their blog, Facebook, or Twitter. You will get an additional entry per post/FB/Twitter, per day, once a donation is received. Please comment here, on Facebook or email me (sweetsergei@hotmail.com) to tell me about your cross posts! I will draw a winner on December 20th, 2012 via random.com and will post the results soon after. Congratulations to our first prize winner, Kristina L.!!!!! She chose the $100 gift card as her prize. 2nd place is Jamie P. who wins the Keurig brewer and K-cups! 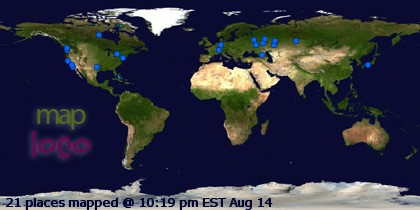 Thank you all for donating, praying and sharing about Sergei! His Angel tree fund is up to $2529! This brings his total adoption fund to $7925!!!!!!! That is such a good start for a family when they decide to commit to him! Please keep praying that his family will step forward soon! I had some thoughts a few days ago about Isaiah 40 in the Bible, where it says "But those who trust in the Lord will find new strength. They will soar high on wings like eagles." I had always interpreted this to mean a restful time of being carried by God, similarly to ,"he lays me down in green pastures and leads me beside still waters" (paraphrase of Ps.23). Well, my new thoughts were that in order to ever soar on wings like eagles, a person must first fly. In order to fly you first have to jump off a cliff! In order to experience the exhilaration of flying and the peace of soaring you have to accept the possible terror of plunging to the ground, of being whipped off course by the wind and of not knowing where you are. Trusting God with both joy and heartache. When I really thought about this, I felt scared. I don't like life dramas. I really can do without any sort of drama in my life, both terrifying and exhilarating. I'd be perfectly content to walk along on a flat surface my whole life and have things be "all right", rather than risk exposure to the bad parts (this is because we've had such a difficult 3 years and I never want to experience that again). But I think God wants us fly for Him. To jump off the metaphorical cliff and risk falling to experience the peace and exhilaration of soaring in Him, on wings of eagles. One place I have recently been experiencing this is with a mom named Julia and her Passed Over Babes giveaway HERE. Chad and I had a sum of money that we had been saving up for a few months in order to donate to Sergei during the Reece's Rainbow Angel Tree fundraising event. I desperately wanted Sergei's adoption fund to be large so that somebody would be encouraged to adopt him without the fear of having to raise the full $20,000. I had prayed and prayed about how best to use that money to draw awareness and money toward this small boy. Julia had recently written on her blog that she regretted not having extra funds to buy prizes in order to hold a big fundraising giveaway for the orphans on the Angel Tree. The idea popped into my head to donate our money (our hard earned, good-sized sum of money! Yikes!) to Julia. Julia, who has a widely read blog. Julia, who has an untempered passion for orphans as well as for Jesus. If I gave her my money, perhaps she could use it to raise money for Sergei along with other orphans of her choosing. Here came all my doubts. My rational fears against jumping off the cliff. It felt like a huge risk. I've read Julia's blog for almost two years, yet I didn't know her in real life. She seemed famous to me in the cyber orphan arena. Why would she even respond a complete stranger? Should I donate the whole amount, i.e. put all my eggs in one basket? What if her fundraiser didn't even break even with the amount of money we put in? What if Sergei's fund didn't increase and every other childs' did? Me on the metaphorical ground. My money blown away into the ocean. Money wasted and cast upon the water. Well, God sees things differently! Ha! He wants me to soar! Ecclesiastes 11:1 says to cast your bread upon the water and you will find it again after many days. So this is what I did: I cast our money, wait!, God's money, to Julia and she set up the Passed Over Babes giveaway (Read her side of the story HERE). She used the money God prompted Chad and I to donate, to raise money for 13 children that have been on the Angel Tree for 3 years, including Sergei!! 13 Passed Over children sitting in an orphanage rotting while their picture is hanging on someones tree. 3 more years of being overlooked and unwanted. Well, her fundraiser has raised over $5000 in 9 days! Talk about a good return on an investment!!!! 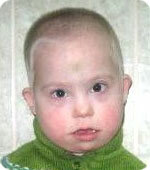 We cast our money upon the water and it has surely returned to us in the form of helping Sergei plus 12 other children! People are seeing their faces. People are giving to them. People are praying for families for these children. There is NO WAY my little blog could have drawn so much visibility to so many children. There is NO WAY I could have made my initial sum of money grow exponentially! I started with ONE lump of money and a heart for ONE orphan. God turned that money into a huge lump of money that is helping 13 children. Soaring is kinda cool! You just watch and look around. The hard part is jumping and trusting! He asked me to do that and I'm SO glad I did! Will you please take a small jump and donate to Sergei and to some of these other kids? Will you please take a small jump and tell your family and friends...people you know in real life? It's scary to ask for money. It's scary to bring up heart-breaking topics like orphans with Down syndrome. Take a little jump and you might catch a little air. God may work through you if you let Him! Same rules as last time except that the prizes (so far) are a brand new Keurig Elite Brewer + 5 (24ct/box) boxes of K-cups. Every donation of $5 will give you 1 entry into my giveaway. A donation of $35 will qualify you for 10 entries plus Reece's Rainbow will send you an ornament with Sergei's picture on it! Bonus Entries: Anyone who donates has the added option to gain more entries by posting about this giveaway on their blog, Facebook, or Twitter. You will get an additional entry per post/FB/Twitter, per day, once a donation is received. Please comment or email me (sweetsergei@hotmail.com) to tell me about your cross posts! I will draw a winner on December 16th, 2011 via random.com and will post the results on December 17th. Click Sergei's picture on the right to get all the Angel Tree info from Reece's Rainbow. I need you to email or comment to let me know you've donated. Congratulations to Melissa W. for winning the Kindle Fire!! It is ordered and on its way to your house!! Yahoo! Now, onto December's giveaway. Same rules as last time except that the prizes (so far) are a brand new Keurig Elite Brewer + 5 (24ct/box) boxes of K-cups. First, Thank you so much to the 28 people who donated and spread the word about my fundraiser for Sergei! You all are so wonderful and helped to raise $1829 for Sergei's adoption fund! Don't forget to visit Julia's blog about the Passed Over Babes (of which Sergei is one), and you can be entered to win over $1600 in prizes!! Only 3 more days to donate to Sergei's fund to be entered into the Kindle Fire giveaway! Please share with your family and friends, let me know and you can receive extra entries!! Also, Check out this huge fundraiser that includes Sergei and 12 other forgotten Babes on the Angel Tree. Spread the word about and donate to these precious children!! PLEASE!!! Thank you so much for the many generous donations Sergei has already received! His Angel Tree account is at $1293, as of today, which puts his total adoption grant at over $6000! That's all from you guys! From last years' fundraiser and this years' efforts. We are doing great! Let's get him a huge grant so that somebody will not stumble (or choke) over the monumental cost of adoption. We will be helping a family step forward and be brave, if money is the only object holding them back from welcoming this sweet child into their family. Please consider spreading the word AND donating to Sergei. Meanwhile, don't forget that I am also getting ready for my December fundraiser. 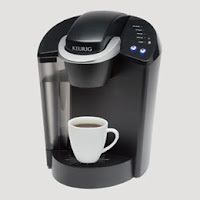 It starts December 1st and so far one of the prizes is a brand new Keurig Brewer with 4 boxes of Kcups. There will be more prizes added to the December drawing, but you'll have to wait and see what they are! Donate securely using PayPal through the Reece's Rainbow donation box. Email, comment or message me with your donation amount if you'd like to be entered into the drawing. 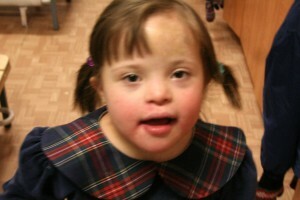 YOU can make a difference in the life of an orphan with Down Syndrome! I have received all the donations, just they weren't displaying on my blog. Please donate using Reece's Rainbow's donate button. EMAIL or COMMENT with your contact info and amount of donation if you'd like to be entered into the drawing. I cannot see who donates when ChipIn isn't working. You don't need to contact me if you've already donated prior to now. I have your info. Sorry for the confusion! GIVEAWAY RECAP: here are the GIVEAWAY details for all those people out there who like the idea of 'winning' a sweet Christmas present to either keep or give away, there's an added incentive in giving to sweet Sergei. I am donating a brand new Amazon Kindle Fire!!!!! I will draw a winner on November 30, 2011 via random.com and will post the results on December 1st. 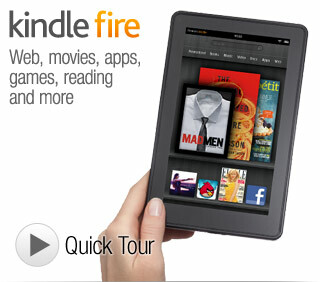 The winner will have a brand new Kindle Fire mailed to you directly from Amazon!!!! There will also be another drawing starting on December 1st and running through December 31st. I will post details about the sweet prizes as time gets closer!!! There may even be small weekly giveaways to keep you enticed! Some of you may remember my attempts last year to raise money for a little orphan with Down syndrome during Reece's Rainbow's Christmas Angel Tree fundraiser. See here He is called Sergei G. on the Reece's Rainbow Waiting Children page. You may also remember that you and I helped raise over $3000 for his adoption fund!!!! WAHOOOOO! Reece's Rainbow is an organization that promotes the international adoption of children with Down syndrome in a way that seems very unique to me. They create accounts for each of the children on their 'Waiting Children' pages and people can donate to a specific child. When a family comes forth to adopt a child, the money in that child's account is used for the adoption fees. If the adoption falls through for some reason, the money stays in the child's account so that another family can make use of the money! The goal of a Christmas Warrior is to commit to raising $1000 for a child on RR's Christmas Angel Tree. However, it costs $25,000 to adopt a child with Ds from an orphanage/institution so I set a CRAZY goal for myself, and for you all, to see if we can add $5,000 to his current adoption fund of $5396. That would be over $10,000!!!!!!!!!! Oh, please help Sergei find a family!!! Please tell your friends and family. Please go to Reece's Rainbow's Angel Tree kids and gaze at all of these Down syndrome beauties; gaze at their sweetness; their innocence. Do any of them touch your heart? Does Sergei touch your heart enough for you to repost on Facebook or to email my blog to your family? To donate? November 1st is the start of Reece's Rainbow's Angel Tree Fundraiser!!! I will again be raising money for Sergei G, in the hopes that someone out there may see him and decide that he will become their new son! When this happens, this new family will be given a good financial start for their adoption of him! Someone MUST want this sweet Sergei as their new son!!! ARE YOU HIS NEW MAMA OR DADDY? Stay tuned for some sweet giveaways that I will be holding throughout November and December! My goal is to raise $5000 and increase his current grant of $5396 to OVER $10,000!!!!! We can do it, friends, by spreading the word and donating to Sergei!!! Go to www.reecesrainbow.com for more info. and Tears are also known as 'cry drops'. I like it! I need to highlight two other families that desperately need help. 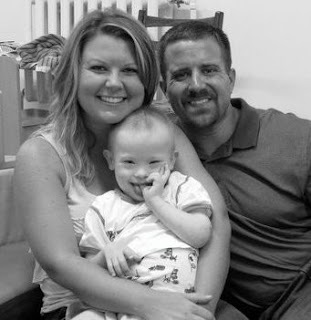 The first is the Davis family who is trying to adopt a sweet little boy with Down syndrome in Eastern Europe. They met in that country's court last week and the judge said that they could not adopt Kirill because he has Down syndrome and he is better off in an institution!!!! They are taking it to that country's Supreme Court and apealling the decision, as there was no other reason the judge declined the Davis family from adopting from that country. Here is the Davis' blog. PLease pray that the court will grant the appeal, in which case it goes back to the original judge to be tried again. The judge told the Davis' that if the appeal was granted and sent back to her court she would not fight it. Here is a link (here ) that talks about Kirill and his family in case you want to read more than the tiny bit I've posted. This is a video of sweet Kirill meeting his mom, Tesney, for the very first time along with a second link telling more about their first visit together. Kirill was the first Reeces Rainbow child that I was drawn to, prayed for and donated to. I've always had a special place in my heart for him and have been praying for the Davis' during their looooong process to adopt him. Also, there are 2 more families waiting to go to the same judge to try to adopt 2 other children with Down syndrome. If Kirill's appeal and 2nd trial fail, then these families most likely won't be granted adoption of their sweet kids! A lot is at stake here!!! Please pray!!! The second family is the Beamish Family. They are adopting a little girl named 'Kameron' and are leaving this Sunday to go get her!! They've already raised $7000, but still need about $8000 more to pay for their trip. Here is a link that tells their story and tells about being able to win a Kindle and an IPad. Please pray that they can raise the money to actually bring their little girl home and please donate if you feel lead. I want to spread the word about two Reece's Rainbow families that are trying to bring home their soon-to-be-adopted daughters. While I don't know these families 'in person' I have been following blogs and their stories on the RR Yahoo group. They are working hard to raise money, so I thought I'd put a shout out to spread the word and give you a chance to be entered into their awesome give-aways! I won't deny it, I want to win an IPAD2 or some sweet jewelry!! Hehehe!! But you all know enough about me to know that even more than wanting 'things', I want orphans with Down syndrome to have a family and have a home!!! So it's kind of a win-win. They get more $$ and awareness for their adoptions; and I get to help out a cause and children I love by donating my money and by spreading the word.... and MAYBE I'll get a sweet prize too!! It's been awhile! I don't have much to say, but I want to jot down a couple of 'funnies' the boys have said recently so that I won't forget them. The other night Kai said, "Mama, Jesus lives in my heart!" Me: "You're right! It's so wonderful you know that, Kai!" Kai: "I can feel Jesus in my heart at night when I'm in bed." Me: "Wow! That is SO great Kai!" (Me thinking: Oh my goodness! Did Kai accept Christ and I didn't even know about it? Does he see angels and stuff? Do I start talking about sin and forgiveness and all that stuff with him now?!!!" Kai: "Yeah, He goes 'bump BUMP, bump BUMP, bump BUMP' in my heart. He's very bumpy." We spent some time with my dad this past weekend and I suspect he was saying one of his favorite quotes to my boys, "Hi ho, Silver! Away!!!" I'm pretty sure I've never said that, and I know that my dad often said this when I was growing up at different silly opportunities, so I'm betting it may have come out of his lips while the boys were running around, back and forth all day. The reason I bring this up is because yesterday Kai and Zeze were running around the house yelling, "Hi, old slipper! Away!!" Email/comment the amount of your donation to be entered in the giveaway. Started @ $11,261.60. Hi! I have been married to my wonderful husband for 10 years! This is a blog about our family and the things that go on with 3 sons, 2 special needs and 1 set of twins. Enjoy!